In its short history, Illuminations has become a bright light in upscale mall retailing. Founded in 1996 by noted retailer Wally Arnold, Illuminations stores had grown to 70 in 2000 and the company was forecasting 250 stores by 2005. The success of the company has been based on the presentation of best-quality goods in a unique theatrical setting. The right "sights, sounds, and scents create a special experience for our customers," according to Cory Van Buskirk, Senior VP for Supply Chain Operations. Illuminations manufactures most of their line of candles in North America and maintains the highest quality product standards in the industry. The company also offers a designer line of candle accessories and home decor products. In addition to the stores, the product lines are also offered through Illumination's Direct Consumer Division through catalog and web site operations. In 2000, direct sales were expanding as fast as Illuminations was opening new stores. Success breeds challenge. With exponential growth of the company during the 1990s, the original distribution center in Petaluma CA had reached capacity by 2000. The five year-old DC was holding back the further growth of the network of stores and was not ready to meet the needs of booming e-commerce sales. Illuminations knew that the bulk of future store expansion was going to take place in the eastern half of the country. The company wanted to serve both the stores and the direct consumer efficiently and timely from a single centrally located distribution center. After considerable research, Illuminations selected Kentucky. "We can capture 65% of the US population within a two-day period by ground transportation from Louisville," explained Walt Blum, VP of Logistics. The next challenge was to find a systems integrator with experience in both retail and direct-to-consumer distribution. Walt was familiar with FloStor's comprehensive design-build, turnkey approach to material handling systems. Together with John Fisher, FloStor Sales Engineer, Walt visited a number of both retail and direct FloStor projects. Walt selected FloStor because he was "confident that they could integrate both systems into the same facility, meeting all our operational requirements within a very restricted budget". The application of proven technologies was an important consideration for Illuminations. $3.2M Over Budget: Now What? 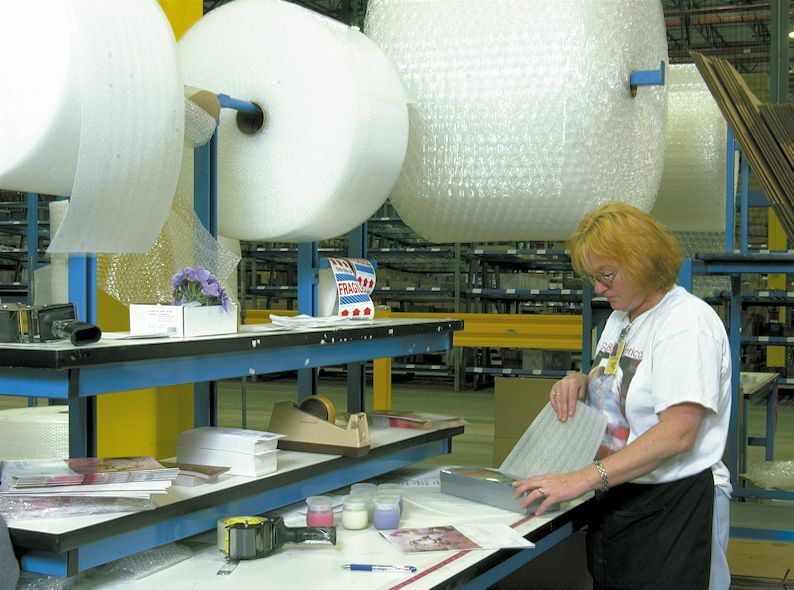 Illuminations needed two independent systems: a full-case picking operation to serve the retail division and an open-case picking operation for direct consumer order fulfillment. Both systems would draw from about 1,500 SKUs. Both systems envisioned an interface with a common Warehouse Management System, with the picking process directed by RF devices. As with all 4th quarter retailers, the cost of building a supply chain infrastructure for two months of peak activity is a significant burden. When the cost of the ideal systems exceeded a very real budget by 115%, it was time to roll up the sleeves and get creative. Through extensive collaboration between Illuminations and FloStor's engineering team, the project was value engineered from an initial cost of $6M to the budget allocation of $2.8M. "A phased approach, allowing for cost effective expansion in the future, saved millions," said Fisher. Illuminations initially expected to build systems that would meet capacities forecasted in five years. Cost savings were achieved by scaling back the initial capacity of the systems, eliminating nonessential functionality, and reusing existing equipment when practical. The final design anticipates expansion of additional capacity and functionality as the supply chain budget allows. 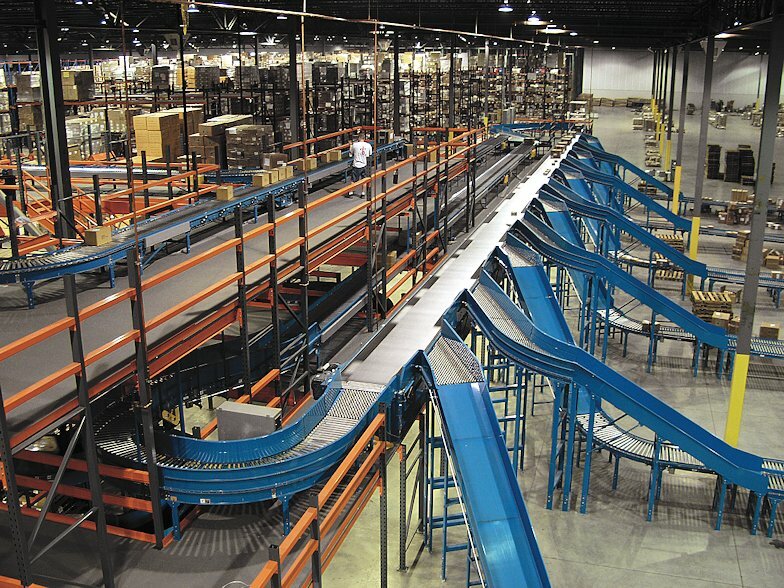 The use of modular conveyor and fieldbus control systems allows for cost-efficient expansion -- without interrupting operations. In hindsight, reducing the initial capacity of the DC proved to be prudent. The roadblocks encountered by the US economy in 2001 forced Illuminations to revise growth plans, and additional capacity will not be required until 2005. The retail stores are typically replenished with weekly shipments of 5 pallets of full case product. Orders are fulfilled from flow rack on 3 levels, configured in two modules. Each module contains about 365 pallets, estimated as 2 days of inventory. Storage within the pick modules is organized by like-type product so that Illuminations can build pallets according to product type. Storage locations along the pick belt are two or three deep pallet-flow, selective-rack, or case-flow. This variability of location capacity accommodates a tremendous range of product velocity. Picking is conducted in batches of about 20 stores at a time. 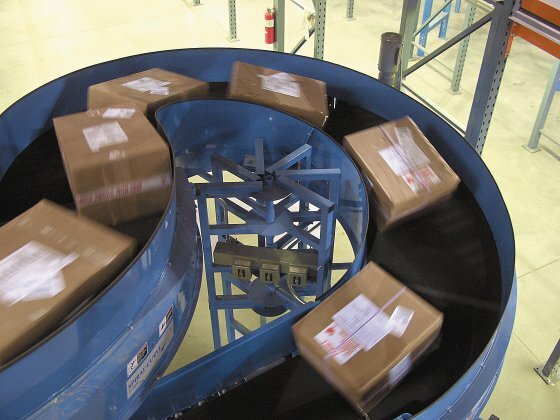 Each picked case is placed on a powered belt conveyor and delivered to shipping as directed by the conveyor control system. The case arrives at one of ten shipping lanes with a human readable store code label for easy visual sortation. System capacity is 31,000 cases per day, capable of supplying a retail network of 145 stores; expanded capacity will be 53,300 cases per day, serving 250 stores. 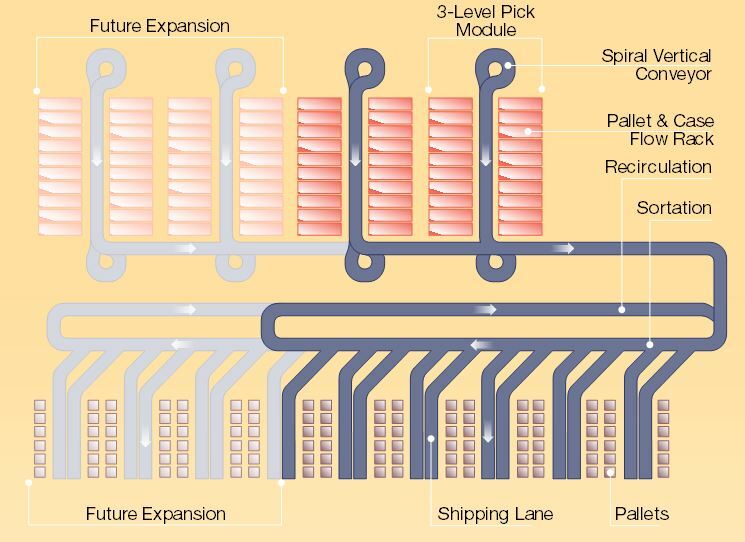 To achieve expanded capacity, the existing two pick modules will be replicated and the existing shipping lane sorter will be extended. Pick rates per man hour have more than doubled on both sides of the business as compared with what Illuminations was able to achieve at the old DC. In terms of productivity, "we definitely met our objectives," according to Blum. "We've been very happy with the results. We have realized 25-30% improvement in productivity on the retail side and on the direct side we have achieved close to 200%. During our peak volume period of November/December we were doing some incredible volumes we never would have been able to do in Petaluma even around the clock. As forecasted by FloStor, 50% of capital expenditure costs were recaptured in the first year." 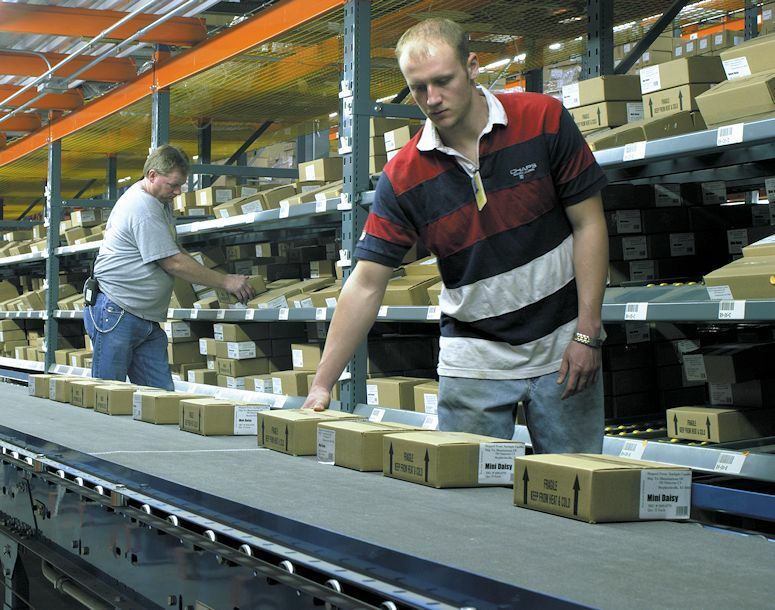 Equally important as the gains in productivity were the gains in goodwill achieved with employees when Illuminations elected to install quiet conveyor rollers. Illuminations wanted to make this a "great place to work," said Blum. "FloStor recommended the quiet roller as being of great benefit relative to cost and our employees are very happy they no longer have to shout." Once we opened up the facility we realized right away we had made the right decision. I wouldn't have done anything differently in terms of layout. We know it will be able to accommodate our forecasted growth. FloStor was very customer-focused, very willing to work with the customer. They kept us on track, on time, on budget. In terms of meeting deadlines, they were right on target. If things had to be done on a certain date, they did it. I have to say I was very very happy with all aspects of the project.